How To Watch The March On Washington Anniversary Ceremony : The Two-Way Here's where to see or listen to coverage of Wednesday's ceremony. Among those scheduled to speak: President Obama; former presidents Carter and Clinton; and Caroline Kennedy, daughter of the nation's 35th president. The crowd is gathering near the Lincoln Memorial in Washington, D.C., for Wednesday's celebration of the March on Washington's 50th anniversary. 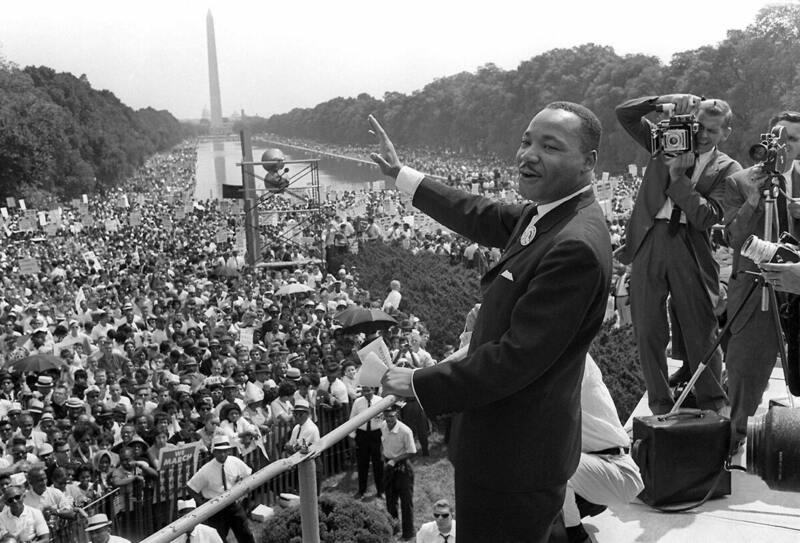 Much has already been said and written about the day when Martin Luther King Jr. delivered his "I Have a Dream" speech and the ceremony being held today. Click here for a collection of NPR's coverage. We don't need to go on at length just now. Rest assured that we'll have coverage from the scene and of the speeches this afternoon by former presidents Carter and Clinton, Caroline Kennedy, President Obama and others. We'll also embed an audio player so that you can hear NPR's special coverage, which is set to begin at 2 p.m. ET. What we want to alert everyone to before things get going, is that the OfficialMLKDream50 website expects to start its webcast at 11 a.m. ET. If there are any technical problems with that broadcast, C-SPAN is among others who will be streaming coverage. Check back with us as the day continues for more coverage. Tracy Martin and Sybrina Fuller, parents of Trayvon Martin — the Florida teen whose 2012 death reignited a discussion of race relations — just appeared on the memorial's steps to sing "Blowin' In The Wind" with Noel (Paul) Stookey and Peter Yarrow (of Peter, Paul & Mary fame). Update at 11:10 a.m. ET: The webcasts just started.